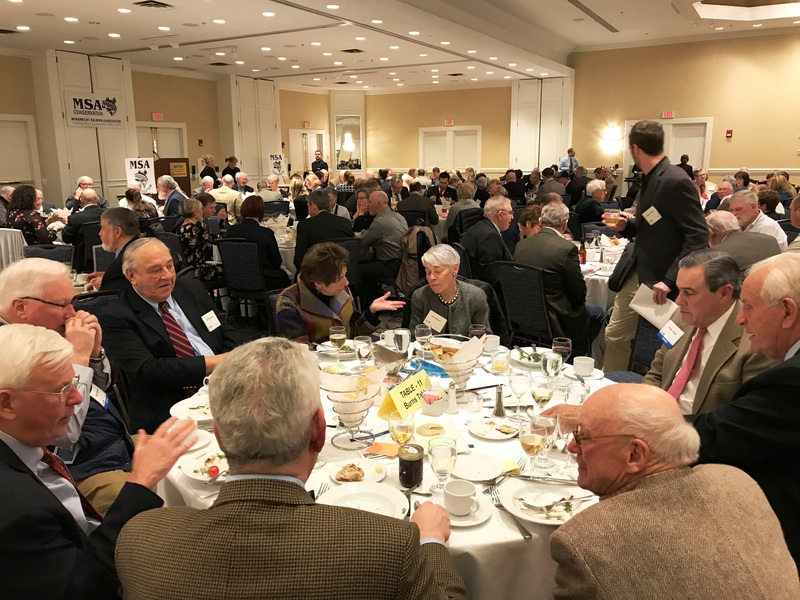 The MSA Boston dinner and auction was on Saturday Feb. 4th. The event was quite well attended, and as usual, lots of fun. Perhaps one of the reasons was the good array of pertinent information presented in the afternoon seminars. The day preceding the event is also the winter board meeting, and we had additional information presented on the conservation efforts of the MSA. Clearly the most important information presented is always the latest status of the stocks. Some years the Canadian government has not yet finalized the previous year’s information, but this year they had, and the news for the Miramichi was a little worse than expected. The total estimated run of large salmon – bigger than grilse, or more than 24 inches – into the Miramichi system was 14,600 fish. The run of grilse was estimated at 13,300 for a total system run of about 28,000. This is lower than my estimate a couple of months ago, and that is because I used the historical average efficiency of the trap nets at Millerton and Cassilis. This year these traps were more efficient than average because of the very low water conditions. The fish stayed out in the estuary and were caught multiple times more frequently than normal. The government graphics above show estimated numbers of salmon and grilse going back as far as the 1970s. 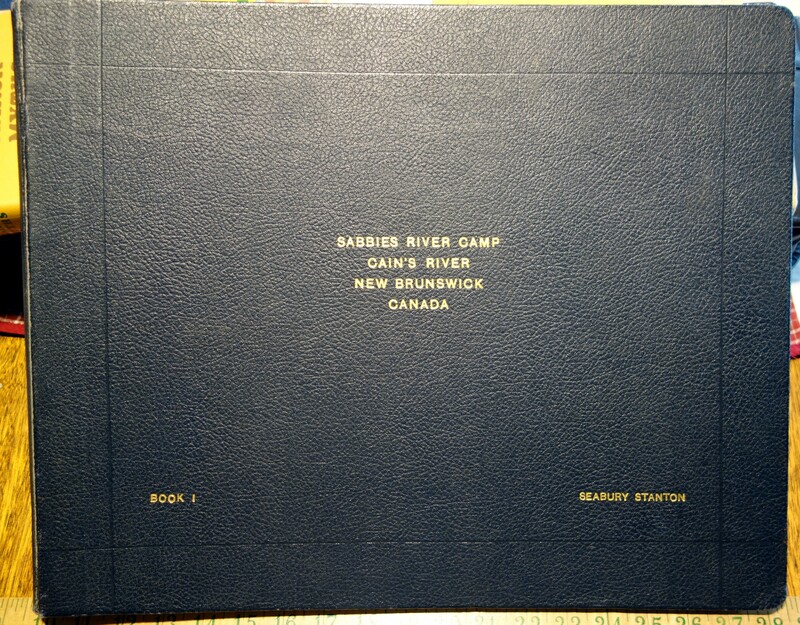 In a September 1997 magazine article by Philip Lee, William K. Hooper, then a senior biologist for the New Brunswick Government, is quoted as saying this about the historic production of the Miramichi River system: “There were big years in the 1920s and 1930s. I wouldn’t be surprised if the river was producing a million fish…. People have forgotten what fish abundance really was like. According to Hooper, the Miramichi experienced its last really great run in 1967, and the total run that year was somewhere upwards of 600,000 fish.” That is about 20 times the 2017 run. Perhaps the single most important statistic to consider is the percentage of conservation requirements that have been met. These are based around estimates of the minimum number of salmon and grilse required to produce the eggs needed to match the river’s capacity to support young salmon. In 2017 the Southwest Miramichi branch reached 82% and the Northwest branch only 60%. Over the last 20 years the SW has reached its minimum 7 times while the NW has reached it only twice. It is generally acknowledged that the minimum conservation requirements are important for genetic diversity and as protection against inevitable bad spawning years. The rivers should fail to reach the conservation requirements only infrequently instead of the other way around which is the current state of affairs. It should be noted that while the 2017 run was poor on the Miramichi, that the Restigouche system turned in the best year on large salmon in the last 20, and comfortably exceeded spawning requirements. So why was the performance of these two rivers with spawning areas only about 60 miles apart so different in 2017? We are going to take a look at some information about striped bass in just a few sentences, but I want to make it clear that I don’t blame all of our problems on striped bass. Marine survival of Atlantic salmon is a problem on both sides of the Atlantic. I fish regularly in Scotland, and I can tell you that the problem there is at least as bad as it is here. We also know that salmon runs were down in Newfoundland this last year. Newfoundland has lots of remote and relatively pristine habitat, no striped bass, and it is much closer to the wintering grounds so that their fish don’t have to worry their way across the Gulf of Saint Lawrence to get to Labrador. While it is true that the Restigouche did reasonably well in 2017, their run is also at just a fraction of its historic levels. Atlantic salmon in the Miramichi system, though, have their own special problem, and that is a thriving population of striped bass that are massing to spawn in the estuary as the Atlantic salmon smolts are leaving. Recently the Atlantic Salmon Federation and the Miramichi Salmon Association released a report on smolt predation by striped bass in the Miramichi system. During an MSA meeting this last weekend we saw a somewhat different presentation that measured the number of tagged smolts making it to different locations on their way down the river, and then out to the Straits of Belle Isle. The ASF/MSA study is limited to tagged smolts that exhibit the movement patterns of fish that have been swallowed by larger fish – such as robustly swimming back up the river. The MSA presentation that we saw looked at total, observable smolt mortality, regardless of the reason, and not just that which could be attributed to striped bass. The short of it in the NW Miramichi is that 2/3 of the smolts were gone before they made it to the estuary. The trip from Rocky Brook in the SW Miramichi looked almost the same. There was very little predation or other mortality in both branches until you got down to tidal portions of the river where the stripers were gathering to spawn. In the course of a few miles within this striper zone most of the smolts disappeared, and the percentage that made it out of the mouth of the river was down to well under 20% in both branches. The percentage making it out of the estuary on the Restigouche is more like 70%. Up until very recent years it was similar to that on the Miramichi too. It is certain that the smolts that have been operated on, and had an electrical transmitting device sewed into their body cavities, are more likely to be caught by a predator than are pristine smolts. It is also not possible to look at the maps and see the declining numbers at each waypoint in the lower river, without realizing that you are looking at striped bass eating these smolts. As the MSA’s Mark Hambrook states, this is really the only thing that has changed in the last 15 years – many more striped bass. 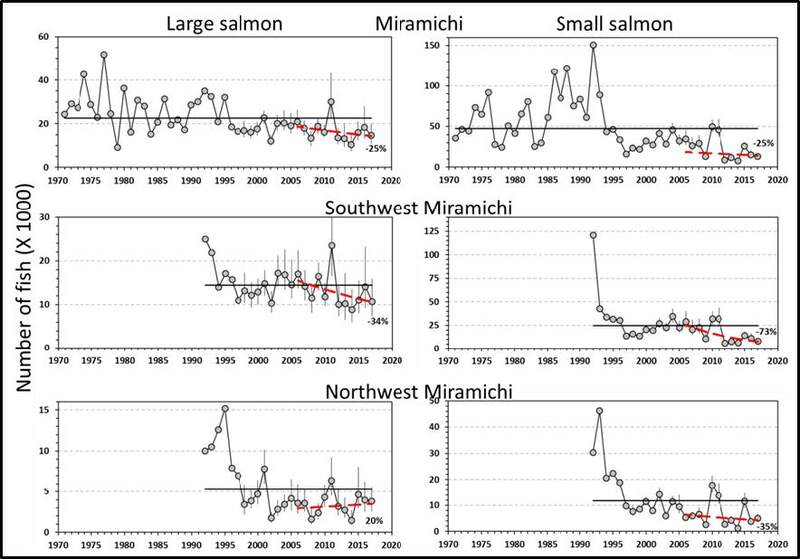 If you look at the Restigouche – which historically had similar smolt survival from up to the mouth as did the Miramichi – as a control model it just further drives the point home. Back in the 1990s the Canadian government thought a target population of adult striped bass in the Miramichi should be around 35,000. It is now about 10 times that many, and it is clear to most people that the population needs to be brought under control to keep a healthy balance with other fish like Atlantic salmon, gasperaux, and smelts. After a very modest relaxation of regulations in 2017, considerably more permissive harvest restrictions including a First Nations net fishery are being considered, but nothing firm has yet been announced for 2018. If there is a concept that is out of favor with some in the scientific community it is the stocking of Atlantic salmon in order to bolster a sagging run. A large controversy has developed over the CAST program’s proposed stocking of adult salmon. The program proposes to take an essentially inconsequential number of out-migrating smolts and place them in the Miramichi Salmon Association’s hatchery, and grow them for 24 months to full spawning age. The fish would then be placed in the appropriate branch of the Miramichi system – matching where the smolts came from – just before spawning time in the fall of the year, and the fish would presumably run up the river to the spawning grounds and reproduce. I think it is safe to say that the controversy boils down to whether or not the fitness of the salmon for breeding – their genetics are unquestionable, as they were 100% wild as smolts – may be compromised by living for 16 months in a tank instead of the open ocean. A recent, state-of-the-art genetic assessment has proven that essentially all of the salmon from every branch within the Miramichi system have the same DNA code. Each branch of the river does not have a unique genetic code. A concept called epigenetics exists, though, that basically says that the DNA code, or at least the way it manifests itself in the actions of the creature can be altered by the animal’s life experiences. A presentation was given by the proponents of the CAST plan that say that the only real risks are that it won’t work. In other words that the released salmon will not swim up the river and spawn, or that if they do spawn somehow their spawn will not survive. If that is the case, say the proponents, we won’t be any worse off than we are, but we will know that approach won’t work. The potential benefits say CAST supporters are that we can keep the river’s population at decent level while we try to figure out why these fish are not surviving to return from the sea in historical percentages. Those opposed to the stocking fear that the hatchery fish may spawn with truly wild fish – that otherwise would have spawned with other wild fish – and that the resulting offspring either won’t survive or will survive but be incompetent to carry on their species as wild fish. The CAST supporters believe that these scenarios are highly unlikely, and feel that it is far more important to take some proactive action now while the Miramichi stocks are still viable instead of waiting for things to approach crisis level – if in fact that ever happens. Last week a peer review by a team of experts listened to a complete description of the program and will shortly be offering an opinion that will be presented to the Canadian Department of Fisheries and Oceans, and will likely decide whether or not the program moves forward – at least at this time. Approximately 10 years ago it was discovered that smallmouth bass had been illegally stocked in Miramichi Lake, located in the Southwest Miramichi’s headwaters. The MSA and ASF immediately called for the lake to cleansed of all fish by applying a chemical called Rotenone. This chemical kills by a complicated process that interferes with oxygen being transported to the cells of the fish. The chemical comes naturally from plant roots, and it has historically been used by native peoples in some parts of the world to partially paralyze fish so that they rise to the surface making them easy to gather for human food. Hundreds of lakes around the world have been rid of invasive species by the use of rotenone. The government has been very slow to move on this issue, but it now appears that things may be moving forward. A special team of experts was recently assembled, and they concluded that the use of rotenone to rid the lake of these predators was doable, and designed a plan. Incomprehensibly it probably won’t happen until 2019, but hopefully progress is being made. I have decided to have Stackpole Press publish this new book rather than going the self-publishing route that I followed with Closing the Season. Self-publishing is a lot of work, and if you are going to produce a full color, hard-cased book as I did with Closing, you are going to make a significant investment financially. Having sold my copy machine sales business I no longer had a warehouse and shipping staff at my disposal. Stackpole is a fine company, and they will be able to market the book through retail channels that I don’t have. They will also have considerable expertise to add to various stages of the design and production process. In 1995 I wrote the L. L. Bean Fly Fishing for Striped Bass Book through Nick Lyons of Lyons Press, and it was a very good experience. I’m looking forward to this new relationship. In any case, the book is still very much a work in progress. I have written about 45,000 words so far, but at least two of the chapters have a fair ways to go, and the brook trout chapter is still in the thinking and research stage. I have found the research work to be fascinating, but requiring much more time than I had imagined. It is a great deal more work than just writing a how-to book from one’s personal experiences. 20 years ago I wrote the striped bass book in half the time I’ve already spent writing On the Cains. A couple of weeks ago I was in California at the home of Patrick Ayres, a friend who is a collector of sporting books. Patrick owns the original, personal fishing logs from Camp Stanton aka Valentine’s, the lodge built by industrialist Seabury Stanton where the Sabbies River flows into the Cains. Pat sells his wares through this website. The original Stanton logs are for sale, and you can contact Pat by scrolling to the bottom of his website. 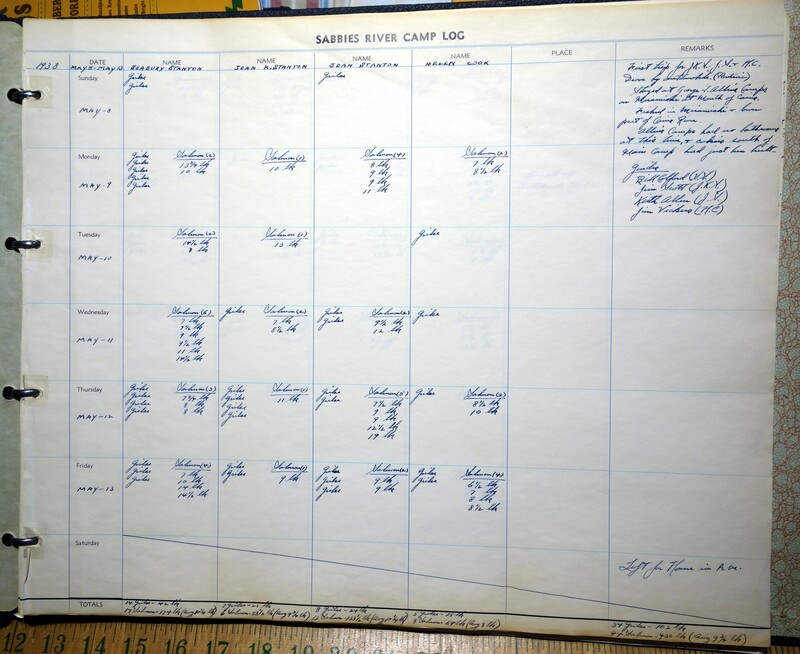 The Camp Stanton log book entries were written by Seabury’s wife Jean Kellog Stanton. They began in 1938 and run through 1971, and they are not simply about the numbers and sizes of the fish. These entries talk about the weather, the runs of fish, who visited the camp, wildlife seen, the trips back and forth from Massachusetts in early airlines or “by Pontiac” over dirt roads etc etc. The entries from the logs will add an important dimension to the book. I am not fond of using Facebook. I find the software, in its effort to manage millions of people like me who are not computer software engineers, to be troublesome and time consuming to navigate. None-the-less it clearly is a fantastic medium, and I have begun to make little posts from time to time about things that I come across that I think may interest some of my blog readers. I still prefer to make larger posts like this one to my blog and not Facebook, but I don’t want to send e-mails to my broadcast list too frequently. If you get a second, check out the recent posts I’ve made to my Facebook page, and see if some of the things I’m posting are of interest to you. Here is a link to my Brad Burns Fly Fishing Facebook page. I love the blog, your knowledge of the area is impressive. I hope I get to buy number one of your upcoming book. Thanks Ken. I will see what can be done! Brad, Thanks for keeping the data in the fishing public eye. The returns in 2011 had us all hopeful, but the trend since then is ominous. My personal catch (fishing log) has indicated an alarming increase in striped bass numbers. My records, dating back to the late 80’s, did not have a single mention of striped bass until 2012. I fish primarily now in the Boiestown area, but for many years fished as far down as Mountain Channel, much closer to the tide. FYI, your remark about Newfoundland having no striped bass was correct until recently. In 2017 I received reports with photos from my friends in St. Barbe who fish the Northern Peninsula rivers. Their photos show alarming numbers of striped bass, some ranging into the mid-teens, encroaching on their Salmon rivers and beaches. I agree that there are many factors stressing the North Atlantic Salmon populations, but the blatant change in the striped bass population should point to the primary course of action that Fisheries and Oceans should address. A good farmer knows what to do when the fox is getting in the hen house…………. I don’t know of anyone who disagrees with you. I can’t speak for DFO’s reluctance to reduce the bass population except that perhaps they are concerned about going too far the other way too rapidly and ending up taking crap for screwing it up. The striper fishery is very popular, and I’m sure they don’t want to send it into a tailspin. Great to see you at the MSA gathering. I can’t wait to use the rod you donated the I got at the live auction. Follow the money ! When the nonresidents stop coming the province will feel the loss of income & then & only then will something be done to correct this issue. The locals will fish for bass but nonresidents wont. Brad, I would like to know if the work done at the Machias Maine hatchery that is following the recommendations of Peter Gray was presented at the recent ASF meeting . I appreciated your thorough explanations of the recent work. Jack – yes it was. A lot of this presentation was an introductory presentation to the audience to provide them with the basics of what the hatchery is about. The e.d. Dwayne Shaw is a biologist himself, and is clearly a supporter of the role of hatcheries as a preemptive tool in stock management rather than viewing it as a last ditch effort as is fashionable these days with a segment of the scientific community. Dwayne explained the principals of the late Peter Gray’s philosophies on raising parr as “young athletes” and stocking in large numbers. these are the techniques that brought the Tyne back in Scotland back from near zero returns to a very robust fishery. Dwayne lamented the limited number of eggs available to them currently. They are simply not able to stock on the scale that they need to. Parr densities and outgoing smolts, though, are increasing in the East Machias River, and Dwayne was quite upbeat about the progress of the project. Bradd, thanks for the thorough review of the meeting. Sorry I missed it as it looked like a lot of great information was provided. I’m curious about the CAST supporters reaction to the ‘Peter Grey” hatchery approach presented by Dwayne Shaw of the Downeast Salmon Federation? If the river is not producing enough wild smolts it seems a much less intrusive way to try and increase the amount of smolts in the river based on what I have read about the DSF effort. If , however, you look at the MSA studies on smolt populations it looks like the river is still producing a large and reasonably consistent amount of smolts ready to migrate out. In most salmon rivers smolt production it is usually limited by the habitat’s ability to rear them. That might be the case in the Miramichi. I sincerely doubt any stocking program is going to be able to increase the number of smolts enough to offset a 3x increase in mortality in the lower river. I accept we’ll never see the runs of old but it seems eminently possible with the right focus on reducing in river mortality of the wild smolts the river is currently producing we could get runs back to where they were 15 years ago. William – the CAST team is headed up by some very smart folks with plenty of money and connections. They knew from the start that anything they proposed would find someone to disagree with it, and they brought together a wide array of the best salmon biologists that could be found to come up with the best plan possible. These included representatives from academia, DFO, ASF, MSA, and more. The idea of taking wild smolts and growing them for 16 months in a hatchery and then releasing them to spawn naturally was the best collective concept, and it is not a new one. This same idea has been used successfully in other places. Nothing except for completely natural is completely natural, so there will always be room to doubt if any stocking program is the right thing to do. The reason that CAST thinks we need to act now is because the river is no longer reaching its minimum conservation requirements. The idea is not to create a ton of fish for fishermen, but rather to try and keep the smolt counts high enough for the population to continue being viable until other problems like striped bass and sea winter survival can be fixed. I’ve just researched this particular point, so I can say with conviction that if there is one thing that the Miramichi system has no shortage of it is spawning habitat. One of the reasons that the CAST group decided on stocking adult fish rather than parr is that the adults will hopefully swim up the river and naturally find a spot that they like. Stocking requires that you drive a tank truck in near the river, and there are large stretches of the Miramichi system that just aren’t easily accessible by road. It is interesting to note that the MSA has been stocking parr and in recent years first feeding fingerlings into the Miramichi for many years. In fact the Miramichi hatchery has been stocking parr or fry into sections of the river with poor parr density for well over 100 years. The CAST crew was aware of all alternatives, but they picked this one as their best choice. The CAST program has recently been thoroughly peer reviewed, and we will get the report in a few weeks. I will report on it here as soon as I hear about it. Personally I realize that I’m simply not qualified to have a really worthwhile opinion on whether or not this is the best way to go. I will probably decide that the independent team knows more than I do and just accept their judgment. Great summary of information……. Was there any mention of the work Paul Christman has been doing here in Me with egg planting versus direct stocking methods? David – that was not mentioned. The MSA has been planting first feeding fry for years, and I have meant to ask Mark Hambrook his views on the egg planting concepts as an alternative. Assumedly the idea is that there is some natural selection process involved in determining which alevin emerge and which ones perish that is lost by growing the eggs in a hatchery. I’m not a biologist, but I do believe that there is a large measure of serendipity in the entire spawning process, and that no matter how carefully selected the position of the redd is, that it can be wiped out by ice anyway, and that there is similar luck involved with where you as an egg happen to be buried. In Peter Gray’s book he talked about the futility of stocking fry into the cold sterile waters of Scotland streams too early in the season. When the MSA puts out fry it is already June, the water is in the low 60s and insect life is everywhere. To me if you are going to stock eggs or fry you might as well get the most out of your eggs. Hi Brad, Jim Corrigan here. I’m wondering if there was any later-season follow-up to the data from the CAST remote sensing detectors placed in the Main SW at Blackville to count passing fish. I have seen their numbers for June through August, but nothing since. Based on my and others experiences last October, it appeared if a lot of the year’s run had come through at the end of, or after, the close of the fishing season. I’m looking forward to seeing the numbers of fish recorded by the CAST sensors for September and October. Do you have any news about these results? Jim – the counters, also supplied by CAST, can be found here https://www.castsalmon.com/fish-count.html. The numbers have been updated through the end of the season. You will see that they show approx. 16,000 net upstream fish through the Southwest Miramichi site in Blackville and 6,000 through the Little Southwest at Oxbow. As you can see looking at the graphic only the net upstream fish are counted, so since all striped bass return down the river these should be salmon. This is about 6,000 less than the DFO count using the mark and recapture method, but the location of the cameras necessarily leaves out certain tributaries that have salmon runs like the Renous and Bartholomew on the Southwest and the entire Northwest Branch. These could easily explain the difference putting the two counts into more or less agreement. That is the important information which is should know all the fishing lovers and fisherman. I love this blog and I prefer this one to my all the friend. I also love fishing and my experience is more than 5 years. The graphs you show here, that was great. That late winter salmon fishing trip is a motivation for all the fishing lovers. I gather huge knowledge all about salmon fishing.